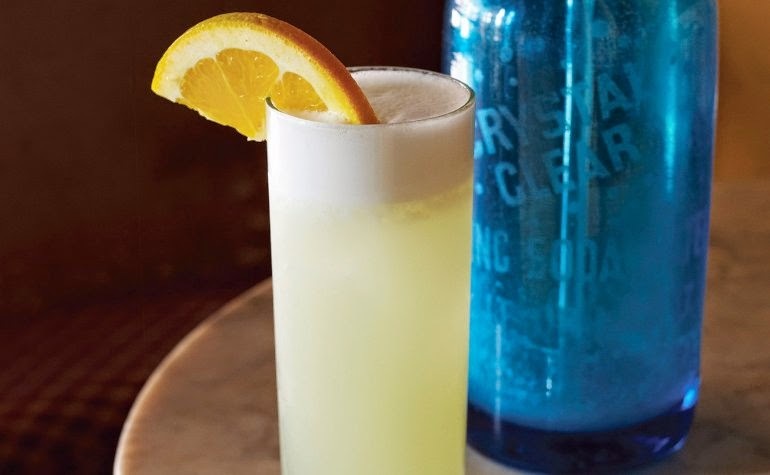 Inspired by the classic Ramos Gin Fizz, this light, complex cocktail pairs beautifully with brunch dishes–and will have your weekend guests asking for the recipe! Combine gin, lemon juice, syrup, Chartreuse, orange blossom water and egg white in a shaker. Shake vigorously without ice for 10 seconds, then add ice and shake vigorously for an additional 10 seconds. Strain into a chilled Collins glass filled with ice, then top with soda and garnish with an orange wheel. Notes: An unobtrusive gin, like Plymouth or St George's Botanivore, will bring together the other ingredients will aplomb. There are inexpensive bottles of Chartreuse to be found, but the good stuff is well worth the higher price tag, and is one of gin's best partners. Cheers! Recipe adapted from Speakeasy by Jason Kosmas and Dushan Zaric by PUNCH, photo by John Kernick.